Everyone can use some extra money during the holidays. Fortunately, there are some ways to generate extra cash. You just have to be willing to think outside the box. If you take the offer and move there, “new residents will be paid $25,200 USD per adult and $10,000 USD per child.” No word if the agreement includes discounts on Swiss cheese or Swiss Miss hot chocolate, but it's still a heck of a deal. Perhaps you don't want to leave Michigan, but are still looking for a way to stretch your money. I'm told that many people are opting to give “experiences” as gifts this year, rather than traditional presents. In that case, I may have a deal for you, particularly if you're a skier. And it's just southeast of Cadillac. I must admit, I was a bit surprised by this rating. I have been a ski writer for 35 years and in all that time, I have never heard the words “Harrison” and “ski” mentioned together. Realtor.com says: “Founded in 1949, Snow Snake Mountain covers more than 40 acres and has six lifts and 10 runs for beginning and intermediate skiers and snowboarders. There's also a tubing run.” The vertical rise at Snow Snake is 220 feet and it has one chairlift, so it's a nice mid-Michigan operation. 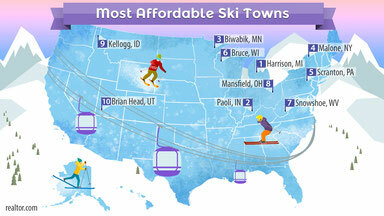 Given the median home price, I guess the rating makes sense if you stretch the definition of “ski town” a smidgen. Particularly if you compare it to America's least affordable ski town – Aspen, Colorado – with a median home price of $2,124,000. 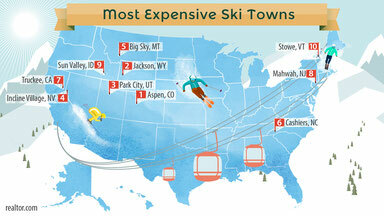 Of course Aspen is in the Rockies and has four ski areas at its doorstep. Those areas combine for 13,338 feet of vertical, 42 lifts, and 336 trails. But who's counting. A rating is a rating, so ski hats off to Harrison, where your ski dollar schusses farther. Speaking of saving money on skiing, nothing is better than “free.” Fourth and Fifth graders can ski free in Michigan. “The Michigan Snowsports Industries Association has established a state-wide program that provides every 4th and 5th graders the opportunity to ski for free. Students can obtain a “Cold is Cool” Ski & Ride Passport that gives them up to three free lift tickets or trail passes over 25 participating ski areas, plus additional discounts on the slopes and in Michigan ski shops.” Many Northern Michigan ski resorts offer this program. For details go to: http://www.goskimichigan.com/michigan-ski-programs/michigan-ski-cold-is-cool. In terms of spending money, it's always fun to calculate the prices of the twelve gifts from the classic carol "The Twelve Days of Christmas." The PNC Christmas Price Index has been doing this for thirty years. This year the total cost is $34,558.65, approximately $200 or 0.6 percent more than last year. Of the twelve items, only three saw a cost increase. 'For “A Partridge in a Pear Tree,” the pear tree increased 5.2 percent, from $189.99 to $199.95 due to the limited supply of larger, more mature trees. The “Gold Rings” jumped 10 percent due to increased demand and popularity. After two years of stagnant wages, the “Lords-a-Leaping” got a modest raise of two percent.' See the entire breakdown of expenses at: https://www.pnc.com/en/about-pnc/topics/pnc-christmas-price-index.html. All that snow falling this week is pure “white gold” for the Cadillac economy. We've already seen winter storms Aiden, Benji and Chloe. Next in line are Dylan, Ethan and Frankie. “The Weather Channel has released the brand new list of 2017-2018 winter storm names. This year the names are all based on 2016’s most popular baby names.” I recognized most of the names, but I must admit I did not know that Kalani, Mateo, and Xanto were so popular. You can see the whole list at: https://weloveweather.tv/2017-2018-winter-storm-names/. Finally, don't forget the special Neff Zone Holidays webpage at https://neffzone.com/holidays. It's free fun for the entire family.